In this article, we will explain how to create a “Session State in ASP.NET Core and MVC Core”. In Session State, we can use to save and store user data while the user browses your web app. We already know that in previous versions of ASP.NET, we could store session as key value pair like this “Session[“Name”] = “Rajeesh Menoth”” and implement it in an easy way. But in the latest version of ASP.NET or ASP.NET Core, we need to do a few configurations for accessing and enabling Session State in the application. The main purpose of session is maintaining user data in memory because of HTTP is a stateless protocol. We need to install the stable version of “Microsoft.AspNetCore.Session” from Nuget Package Manager. Then only we can access Session State in ASP.NET Core 1.1. In “.csproj” we can check all the installed packages and versions details in ASP.NET Core 1.1. The following code is the example of sharing session in ASP.NET Core 1.1. // Requires you add the Set extension method mentioned in the SessionExtensions static class. The following code contains the Key name as “SessionKeyName” & Value name as “Rajeesh Menoth”. So we can set the Session String “Key” and “Value” in SetString(“Key”,”Value”). The following code contains a similar Session code as an older version of ASP.NET. We can Assign and Get the Session string value using “GetString(Name)” Method in a simple way. In the following way we can set and get serializable objects to Session in our application. The first step is we need to add the Session services to the container. So we can add the services in “ConfigureServices” method in “Startup.cs” class in our application. We add the “app.UseSession()” inside the Configure Method in “Startup.cs” Class because it gets called by the runtime. One more advantage is we can use this method to configure the HTTP request pipeline in our application. We set 1 mins as the Session Timeout in “ConfigureServices” method in Startup.cs class. We learned how to create Session State In ASP.NET Core and MVC Core. I hope you liked this article. Please share your valuable suggestions and feedback. We are familiar with Sending Email Using Asp.Net With C#. But today, we are going to teach you how to send email using ASP.NET Core 1.1 with MailKit. We can implement it in ASP.Net Core very easily as compared to the previous versions of ASP.NET. MailKit is a cross-platform mail client library built on top of MimeKit. That means we get all the mail sending libraries from MailKit, such as – Simple Mail Transfer Protocol (SMTP) etc. Simple Mail Transfer Protocol (SMTP) is a TCP/IP protocol used in sending and receiving e-mail. Most e-mail systems that send mail over the Internet use SMTP to send messages from one server to another.The messages can then be retrieved with an e-mail client using either POP or IMAP. The following is a list of SMTP Server and Port Numbers. The following assemblies are required for sending email using ASP.NET Core with MailKit. Go to “Tools -> NuGet Package Manager -> Manage Nuget Package for Solutions…” Then, search “MailKit”, Choose and Install the latest version “V1.12.0” in your application. New .NET Core tooling is available in Visual Studio 2017 by default. 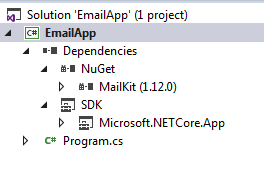 In the Dependencies folder, every package tool has separate folder like MailKit saved into NuGet folder. If you have a client side tool like bower, then its dependencies are saved into it’s folder. The following code contains the mail sending code of ASP.NET Core. When you are sending mail with your “gmail” account, enable less secure apps so that you will be able to login from all apps. Otherwise, it will throw authentication error like 5.5.1 authentication. In the following code, we can mention username for “gmail” account but in other service like “hotmail”, we must provide the full email address because other Microsoft accounts, like Outlook, live, etc. have the same SMTP Server Address “smtp.live.com”. In previous version, ASP.NET Core 1.0 contained all the versions & dependencies in project.json file but in new version, i.e., ASP.NET Core 1.1, they are saved in csproj. We learned how to send email using ASP.NET Core 1.1 with MailKit in Visual Studio 2017. I hope, you liked this article. Please share your valuable suggestions and feedback.